The mission of The Eric M. Suhl Foundation ("EMSF") is to positively impact the lives of those suffering with Crohn's and Colitis and mental health issues. The EMSF was created in memory of Eric Matthew Suhl, who passed away in February 2016. He was 28 years old. He will forever be remembered by his parents Debra and Randy Suhl, his brothers Kyle and Ryan Suhl, and his four legged best friend Callie. Eric was diagnosed with ulcerative colitis in 2008. He was seriously hospitalized twice as the disease’s effects took hold immediately. Despite his struggles, he was consistently upbeat and made every effort to ensure everyone was having fun. In most cases, he refused to talk about how this disease was affecting his life. Each year, the EMSF hosts the Eric M. Suhl Memorial Golf Tournament in his memory. The tournament format is inspired by Eric and his love for those around him to have a good time. It features unique games and contests, allowing golfers of all skill levels to participate and enjoy themselves. To help understand the issues and struggles for those with crohn's and colitis, ABC Channel 13 produced the special, "The Voices of IBD". Eric's story, the Suhl Family and The Eric M. Suhl Foundation were featured. See the segment below! 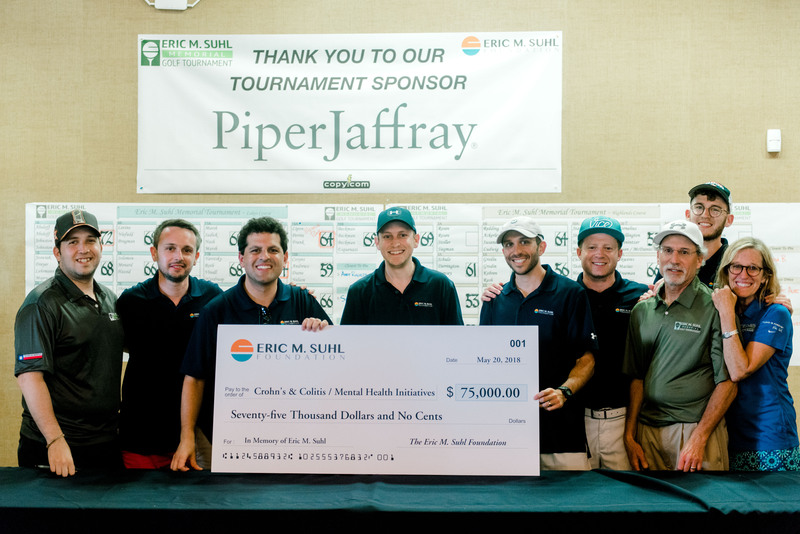 The inaugural Eric M. Suhl Memorial Golf Tournament was held on May 15, 2016, a few months after Eric's passing. The tournament benefited the Crohn's & Colitis Foundation ("CCF"). Additionally, the EMSF formed Team Cool Suhlio, which participated in the Take Steps Walk for Crohn's & Colitis put on by the CCF. With everyone's generosity, we were able to surpass our fundraising goal and donate $25,000 to the CCF. In 2017, the EMSF hosted the 2nd Annual Eric M. Suhl Memorial Golf Tournament as well as participated in the CCF's Take Steps walk. We had over 100 more golfers in 2017 (248 golfers) as the inaugural tournament (136 golfers). As a result, we were able to donate $50,000 to the CCF, doubling our total from 2016. In 2018, The EMSF was proud to form Team Cool Suhlio to again walk in the CCF Take Steps for Crohn's & Colitis on May 19, 2018. The following day, May 20, 2018, the EMSF held the 3rd Annual Eric M. Suhl Memorial Golf Tournament. The weekend benefited Crohn's & Colitis and mental health Initiatives. The tournament had a record 252 golfers, 63 foursomes, participating! Because of the huge turnout both days and the generosity of all of the participants, sponsors, and donors, the EMSF was proud to be able to donate $75,000 towards these initiatives, again increasing the amount donated from the previous year! This brings our 3-year total to $150,000 donated! We could not have done it without all of the great supporters. It is a true testament to Eric’s friends and family. For more information about the allocation of the donations each year, please see our EMSF page. To learn more about the causes we donate towards, please see our Initiatives page. We hope 2019 can be even bigger! For more about our previous golf tournaments, visit the Previous Events page. All donations benefit The Eric M. Suhl Foundation and other charitable organizations. No board member or officer receives a salary or distributions.